The streets of Liverpool were lined with mourners to say farewell to Alfie Evans. There was applause for 23-month-old who died of brain disease as funeral cars passed. About a thousand wellwishers lined the street outside Everton’s stadium to say farewell to Alfie Evans. Alfie died at age 23 months after a legal battle over his hospital care. Members of the public and “Alfie’s Army” were en route to a private burial in Liverpool. Last month, doctors at Alder Hey children’s hospital stopped providing life-support treatment to Alfie. This was against his parents wishes, Tom Evans and Kate James, lost two fights in the high court, court of appeal, supreme court and European court of human rights. Evans and James had hoped to take Alfie, who had a degenerative brain disease, to a hospital in Rome. On Monday, an invitation-only funeral service was held in Liverpool before people gathered to pay their respects. 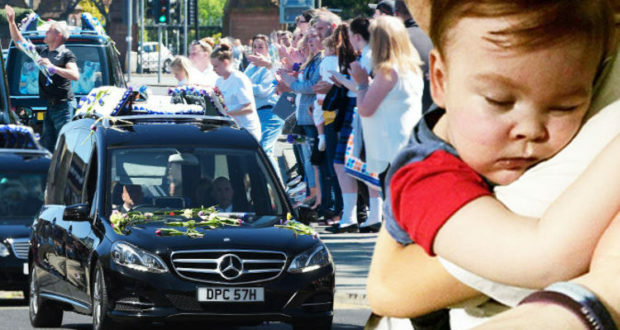 As the cortege passed, people placed flowers on the lead two hearses, which carried floral tributes to Alfie spelling out the words Warrior, Our Hero, Son, Nephew, Grandson and Blue. His coffin sported images of toy soldiers.